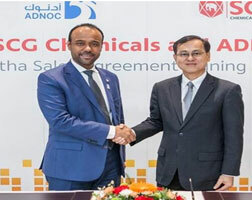 Abu Dhabi National Oil Company (Adnoc) recently signed two agreements with Idemitsu Kosan Co Ltd of Japan and SCG Chemicals of Thailand for a combined amount of up to 1.5 million tonnes of naphtha per year. This follows a similar 3-year signed agreement with Malaysia’s Lotte Chemical Titan (LCT), one of the largest polyolefin producers in South East Asia, for the sale of up to 1 million tonnes per year of naphtha. As part of its 2030 smart growth strategy, Adnoc is pursuing profitable and integrated downstream growth to meet the needs of the evolving market for refined and petrochemical products, particularly in Asia, where the petrochemical market is set to double by 2030. Adnoc is making significant investments in new downstream projects to grow its refining capability and expand its petrochemical production three-fold to 14.4 mpta by 2025. Planned projects include a world scale, mixed liquid feedstock Naphtha cracker, as well as investments in new refinery capacity. As a result of the planned expansions in its downstream business, Adnoc will create one of the world’s largest integrated refining and petrochemical complexes at Ruwais, located in Abu Dhabi’s Al Dhafra region.